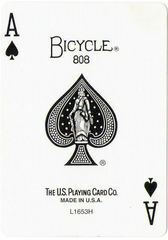 Bicycle Playing Cards are a popular brand of standard playing cards, and are the USPCC's original brand and product. Since 1885, the Bicycle brand has been manufactured by the United States Printing Company, which, in 1894, became the United States Playing Card Company of Cincinnati. "Bicycle" is a trademark of that company. The typical Bicycle deck (Poker-standard Type 808) is a standard issue deck of cards consisting of 52 traditional Anglo-American playing cards, two jokers, an information card, and a card describing poker ranks. As with most decks, the first standard card of the deck is the uniquely-stylized Ace of Spades. The Bicycle trademark is usually also printed on the Ace of Spades. The type number of a Bicycle deck can be found both on the bottom of the deck box and on the stone of the Joker artwork. 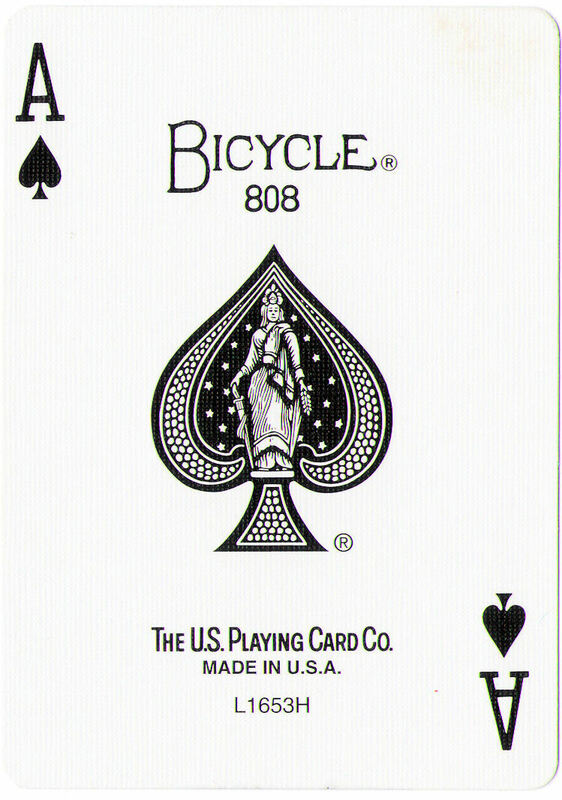 Bicycle playing cards are sold in a variety of decks featuring different cards (such as for use in pinochle), back designs (including the traditional rider back and older Vintage backs), face designs (including Jumbo Index and Lo Vision cards for the visually impaired, and a "PokerPeek" design on their Pro series decks that simplifies looking at hole cards), and sizes (such as narrower bridge decks, thicker Masters Edition cards designed to last longer, and Big Bicycle cards that are four times the normal card size). Any of the aforementioned are traditionally available with red and blue backs, but other back colors (including black, silver, and even pastel colors) are also available. Consumer paper versions of the plastic KEM type WSOP decks are sold under the Bicycle brand. In 2010, Bicycle Playing Cards released special anniversary decks which include a redesigned rear side, redesigned Ace of Spades, and 1885-2010 written under the numbers on the corner on each card (125th Anniversary Edition). The Ace of Spades served a famous purpose in the war in Vietnam. 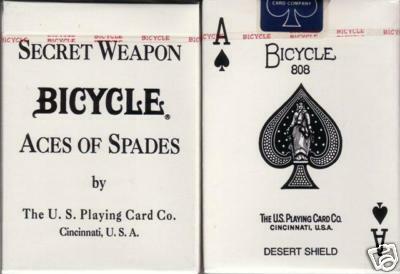 In February, 1966, two lieutenants of Company "C," Second Battalion, 35th Regiment, 25th Infantry Division, wrote The United States Playing Card Company and requested decks containing nothing but the Bicycle Ace of Spades. The cards were useful in psychological warfare. The Viet Cong were very superstitious and highly frightened by this Ace. The French previously had occupied Indo-China, and in French fortunetelling with cards, the Spades predicted death and suffering. The Viet Cong even regarded lady liberty as a goddess of death. USPC shipped thousands of the requested decks gratis to our troops in Vietnam. These decks were housed in plain white tuckcases, inscribed "Bicycle Secret Weapon." The cards were deliberately scattered in the jungle and in hostile villages during raids. The very sight of the Bicycle® Ace was said to cause many Viet Cong to flee. For more on this subject, take a look at this article.